Eight swarasthanas sound lower than keyboard notes. As a result, most swarasthanas will collide with their equivalent note on a keyboard and produce the out-of-tune beating effect as we have heard in case of Ga3. 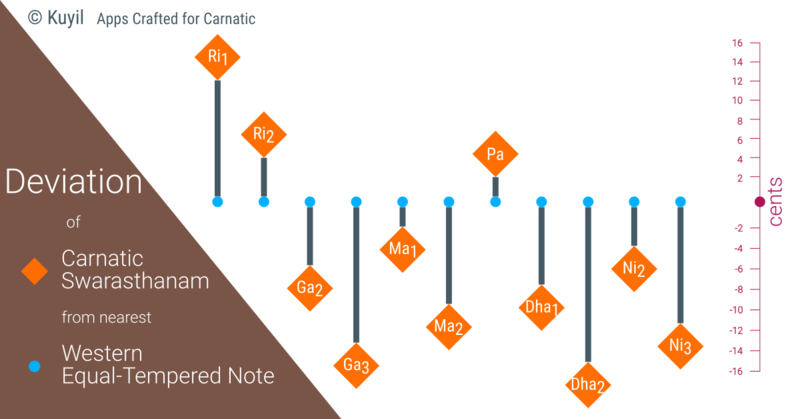 Many carnatic music teachers make their students practice swarasthanas on keyboard in the hope that it might help them to improve their swara gnanam. Contrarily, it will only destroy their sense of swarasthana as most of the notes on a keyboard are very wrong. Let us fully understand the danger: according to this study, use of harmonium, which is also an equal tempered keyboard, has permanently skewed Hindustani music’s swara ratios. Fortunately, influence of harmonium is minimal in carnatic music, and the study says, we still retain the purity of our swarasthanas. Absence of appropriate technology for carnatic is the reason why our teachers and students have to resort to other means such as keyboards. On our part, we have created Shruti Carnatic Tuner, a reliable companion for authentic carnatic swarasthanas. It provides accurate reference tones. It also detects and shows you the swarasthanam when you sing or play. We, at kuyil, will continue to innovate apps tailor-made for carnatic that will empower teachers, students and performers.